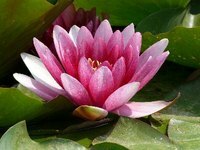 Are Water Lilies Good for Ponds? Water lilies add color and texture to a pond. However, if not properly maintained, they can also grow out of control and cause serious problems. Grown for ornamental use, water lilies are often classified as an invasive species because they can take over a pond or lake. But, when used properly, water lilies can also bring benefits to the ecosystem of your pond as well. Water lilies can help improve water quality in ponds. In a study conducted at the Hebrew University of Jerusalem, researchers discovered that water lilies soak up potentially harmful heavy metals in the water. Since they block out the sun, water lilies can keep temperatures from getting too high in the pond, providing shade for the fish that live there. This is beneficial for species that cannot survive during excessive drought and can use the water lilies as shelter from the hot sun and high temperatures. Water lilies also serve as food for various aquatic wildlife. Water fowl such as ducks eat the plant's seeds, while other animals and birds such as beavers, deer and muskrats feed on the plant's rhizomes, which are rich in starch, sugar and leaves. Native Americans used both the seeds and rhizomes in salves to treat tumors and open sores. They also used the plant to treat digestive problems and fried up the seeds as a snack. When left unchecked, water lilies can grow out of control and disrupt fragile ecosystems. They use up resources, choking out other plants as they spread and using up light, oxygen and important nutrients. This shift in the ecosystem not only kills other plants, but then begins a domino effect that begins to kill off the wildlife that relied on those plants for food. When completely out of control, water lilies can grow and cover the entire span of a pond or lake. Some plants grow beneath the surface of the lake or pond and perish when the water lilies completely block out the sun from getting beneath the surface. They also pose a danger to humans since they can get caught up in boat propellers and make moving about the lake difficult.